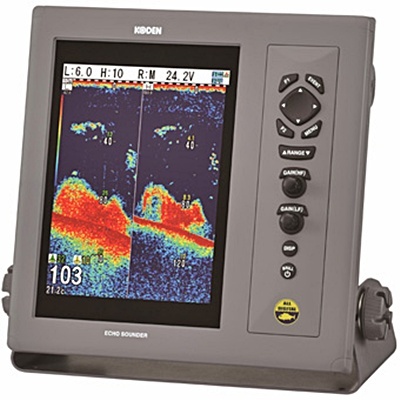 New CVS-1410B color 10.4" sunlight viewable Digital Broadband echo sounder. Dual frequency with a choice of 38 - 75kHz, 42 - 65kHz or 130 - 210kHz which can be set and changed during use. The flexible selection of frequencies by 0.1kHz step enables the user to stay away from interference with sounders on other vessels as well as enhancing fish detection. KDF eliminates clutter by filtering out the noise to provide a clear detailed image enhancing fish targets in shallow & deep waters. Enhancing fish targets makes it easier to differentiate between baitfish, larger shoals etc resulting in a larger catch. Even a novice user can achieve professional results by letting the CVS-1410B pick the optimum settings for such functions as Range, Shift & TVG. Exclusive Sona-Tone identifies what's under your boat with different sounds for fish and schoals of fish. Two types of the broadband transducer are available for your choice. Two selective frequencies can be set and changed during use within the ranges below. Flexible selection of frequencies by 0.1kHz step enables the user to stay away from interference with the sounders on the other vessels. The Koden Digital Filtering has enabled low noise, high resolution and outstanding distance of detection. Takes the guesswork out of operating the sounder. Even a novice user can achieve professional results by letting the CVS-1410B pick the optimum settings for such functions as Range, Shift and TVG.